This Lakeside, CA swimming pool project was to replace all old pool equipment with new energy efficient pool pump, filter and complete pool automation. On top of that, we also installed a great pool heater that works extremely well and holds up really well in the field. 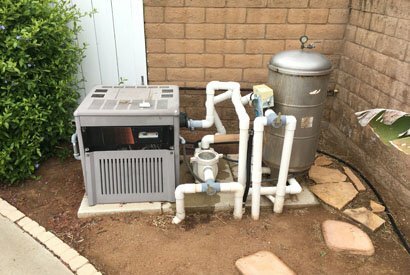 The heater is a propane fueled Raypak 406A pool heater and due to the space and access, this heater installation was a no-brainer. The old pool equipment consisted of a hayward pool heater that is no longer working, a Pentair WhisperFlo single speed pool filter pump, an old Pentair filter. Is also consisted of replacing the pool plumbing while also replacing the old Ortega diverter valves and the electrical time clock. 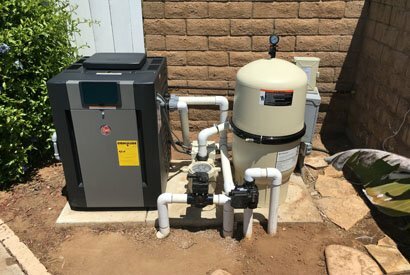 ProTouch Pool Services installed all new equipment for this Lakeside, CA customer that included a Raypak 406A pool heater using propane, a new Pentair variable speed pool pump, filter, Pentair SunTouch pool automation, new plumbing and all new diverter valves. Below explains the new equipment used. Raypak pool heaters that are manufactured by Rheem who makes water heaters and boilers is one of the best pool heaters made and hold up great over time. This pool equipment installation project easily allowed us to install a new Raypak pool heater as there was plenty of space on the equipment pad along with great access to the pool equipment area. We will often choose Raypak though we will also install a Pentair pool heater or another based on the specific requirements, space available and access to the equipment pad. We will also install any other type of pool heater that the customer may request or have already purchased. Filtering the water is being handled by the new Pentair Clean & Clear Plus 420 Sq Ft cartridge filter. This filter is also one of our first choices as cartridge filters are much easier to clean for the pool service technician or the home owner and they are much cleaner by not requiring D.E.. This pool filter install also allows for a higher flow rate, longer gaps between filter cleaning and no backwashing required. Our customer also wanted to go with complete pool automation but did not need all of the bells and whistles so we went with the Pentair SunTouch swimming pool controller with a QuickTouch wireless remote. By having pool automation, the pool owner can turn on and off any of his pool or spas features from the comfort of the house. And because we installed a new Pentair SunTouch pool automation system, we needed to add electronic pool and spa valve actuators. These valve will now be controlled by the wireless remote and when the customer wants to turn something on these valves will automatically change position. This new pool equipment installation in Lakeside, CA was a really clean install and the customer will enjoy the swimming pool and spa that much more not having to walk outside to turn anything on. This install was performed in Lakeside though, we provide this pool service throughout San Diego County.